Specially designed for deep " V" boats with extra long trolling motor shafts. Designed with two straps, the longer strap is mounted where the trolling motor shaft fastens to the mounting bracket and can mount 24" above the deck. The second strap is designed to hold down the actual motor. 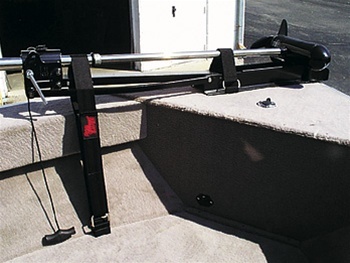 It wraps around the entire mounting bracket and the trolling motor shaft, helping to keep the motor from bouncing when traveling down the lake. Keep your trolling motor tied securely down and undamaged for longer life.